Kristina LaRue, author of the food and nutrition blog, Love and Zest, had some really helpful ideas for eating better (http://blog.myfitnesspal.com/25-life-hacks-to-eat-better). I plan to refer to them off and on throughout the year (she shared 25 tips), but for now, considering the demands of the season we’re in, I thought her suggestion for a 90-second breakfast might appeal to you. She’s got great ideas for quick and delicious, which is definitely the name of the summer meal game! Let’s start with breakfast. As Kristina says, this meal doesn’t need to be a large production; keep it simple for mornings when you have to be out of the house fast (or when you just want to get out as quick as you can to get to that gardening that’s calling your name). 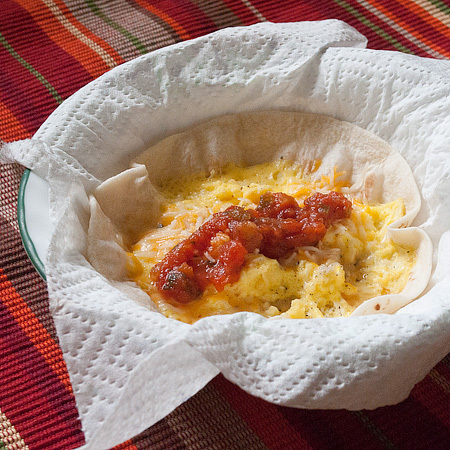 Place one 6-inch tortilla in a cereal bowl. Crack an egg onto the tortilla. Add toppings such as green chilies, a sprinkle of cheese, onions and leftover roasted veggies from the night before. Personal taste reigns with this dish. Microwave for 90 seconds or until the egg is cooked. Top with salsa and voila: breakfast in 90 seconds. NOTE: Place a paper towel under your tortilla so you can easily lift the cooked burrito out of the bowl and wrap it nice and tight. I tried this out on Rich (my adorable “Pancho Picky Puss”). He’s not that easy to please, hence the nickname. This was a home run for sure! I tweaked it a smidge, though: bacon crumbles to up the approval possibility. But this creation does fine without ‘em. 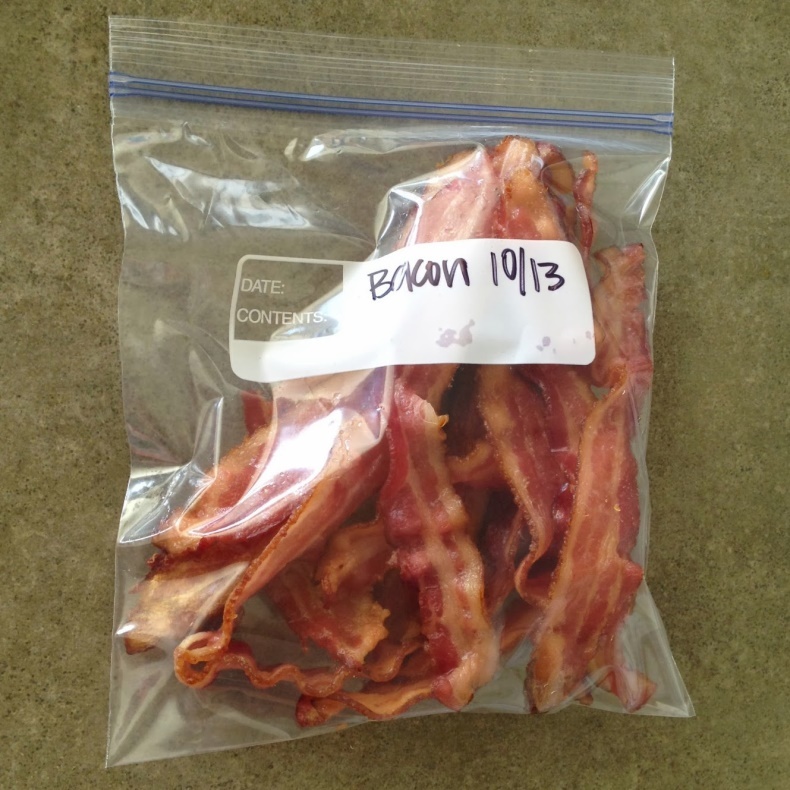 Speaking of bacon, here’s a tip: Fry up a pound of bacon (or bake a pound), drain and let cool. Freeze several strips in a freezer bag so you always have cooked bacon on hand for those BLTs you’ll be making when tomato season hits. And then crumble the rest of the cooked bacon and freeze the crumbles as well. You can never have too much cooked bacon on hand. Now back to fast summer dishes: Since I was so taken with Kristina’s 90-second breakfast, I thought it would be smart to see what else she’s come up with. 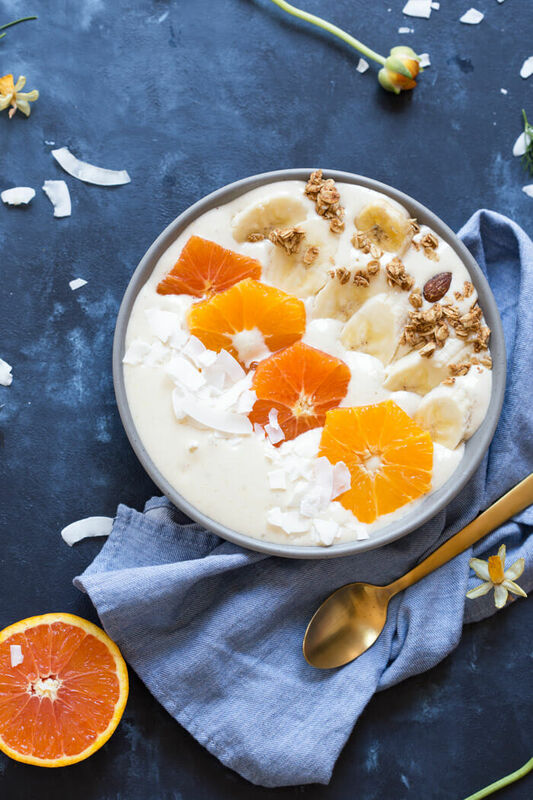 On her blog (www.loveandzest.com), which is lovely and very informative, I found her recipe for another pretty quick and yummy breakfast, her Orange Creamsicle Smoothie Bowl. Just the name sounds divine. In a blender, place frozen banana chunks, protein powder, juice, and vanilla extract. Process until smooth. Pour into two bowls and top with banana slices, orange slices, coconut flakes, granola and a drizzle of creamy almond butter if desired. When I made this breakfast, I changed a few things and the results were terrific. So in case, like me, you’re either not a fan or protein powder (or you just don’t have it on hand), consider using 1 generous cup of Greek yogurt instead. Because the yogurt’s liquidy, I froze all the fruit (peel the orange first, though), to maintain that thicker smoothie consistency. This is truly fast and delicious! Line baking sheet with parchment paper; arrange bacon evenly spaced on baking sheet. Bake for about 25 minutes until fully cooked and crispy. Remove bacon from pan and dry on paper towels to soak up any drippings. Once bacon has cooled, roughly chop; set aside. 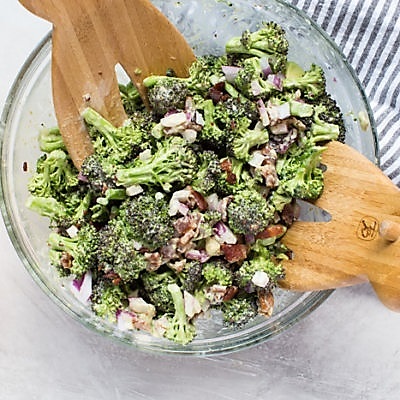 In large bowl, mix together broccoli, avocado, onion, and raisins. 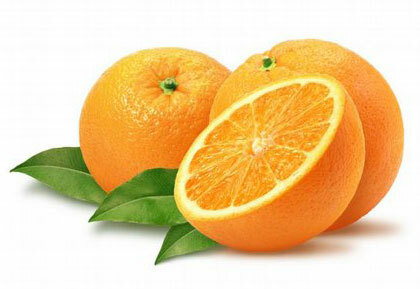 In small bowl, whisk together mayo, orange juice, honey, mustard and salt and pepper to taste. Pour dressing over broccoli mixture and toss to coat broccoli. Garnish salad with bacon and pecans. Serve room temperature or slightly chilled. Quick and delicious. That’s the name of the summer meal game. And aren’t we so glad that food bloggers are always exploring this criteria? We’re definitely the beneficiaries of their brilliance!